Stylish Budget Window Treatments | Attractive and stylish window treatments don’t have to break the bank. Get the look of custom treatments on a budget! Window treatments are one of those hidden costs in home decor. I feel like you never anticipate quite how much they will add up to. You can end up spending hundreds and even thousands for a single window, which is unrealistic for most of us. I have rounded up a collection of options for stylish budget window treatments that you are sure to love in your home! I am pretty middle of the road when it comes to what I’m willing to spend on decor. If a piece of furniture is used often, like our slipcovered sofas, I think it is worth the investment. Window treatments are not an item that I’m willing to spend a lot on. Luckily, there are many options that are both beautiful and inexpensive! I’m going to share some of my favorites in a second, which I’ve used here in my home. First, I do want to mention that there are obviously countless options beyond the natural shades with light drapes and dark hardware combination that I’m sharing with you today. I am sharing these specifically because they are items I have experience with! I use natural shades because I love the texture. They are a nice contrast to my light paint colors. The often tie in with wood finishes in the room I’ve chosen them for. Overall, they add character (which I talked about in this post!) and warmth to your space. This was the first inexpensive natural shade I ever came across. They are available on Amazon and in most home improvement stores in a variety of sizes. They have a warmer finish, and I love how they play off of the natural raw wood in our home. These shades are a step-up from the Spice shades in functionality but are comparable in price. Rather than the roll-up style, which can be a little frustrating, these are a classic roman shade and go up accordion-style. They hold up really well over time. I also really love the driftwood finish, it’s my favorite weathered gray. Honestly, if I found these sooner they would be throughout my house rather than just in a couple of rooms. These roll-up shades are in the same collection as the Spice, they are simply a different and darker finish. They are also a little more expensive, although I do like the contrast. We have these shades in the Dining Room to bring a little of the contrast of the floor to another part of the room. While you can get window treatment hardware in any finish, I just happen to prefer dark. We have dark floors and door hardware, so it is my main choice for our home. With that being said, you don’t have to have just one finish through your house, and the options above come in more than one finish. I do want to note that I did not link to the actual hardware in the photos (it was from IKEA). The reason is that I have found that I don’t really like the large brackets or the large glass finials, which were an add-on and not worth it. These rods are about as classic as you can get. I am actually in the process of switching out the curtain rods that I have in our family room for this more understated hardware. I really like that the brackets are small and hidden by the drapes. This hardware is also very classic but is a bit more elevated with a decorative bracket. The end caps give the rod a more modern flair. I love this industrial-inspired option. Not only do the drapes wrap around, which give them a fuller appearance, but the hardware is extremely stylish on its own and affordable. 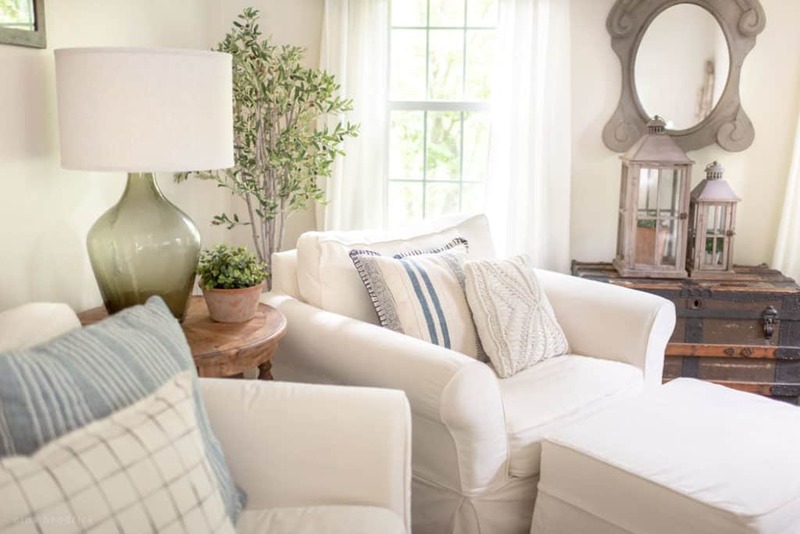 I gravitate toward light and airy drapes because I love the fresh feeling they bring into a room. They look very clean, and you don’t lose much light. They are my go-to choice for curtains and drapes. I have had these drapes for about four years now. They are lovely. While thin, they are not completely sheer. Readers often describe them as “the curtains that look like a bed sheet” and that’s an extremely accurate description. The weight in person is comparable to a standard bed sheet. We had to hem them for our family room, as they come in very long lengths. Overall, they are my absolute favorite curtains. 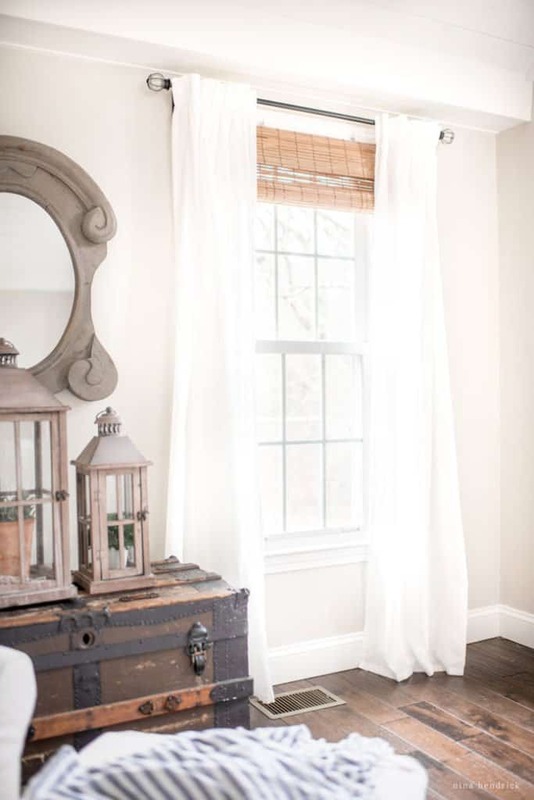 These curtains are an off-white, but they are so sheer that the color doesn’t noticeably clash with white trim. They are beautiful, inexpensive, and a bit whimsical. One caveat is that if you need to hem them, you will have to do so from the top as the rest of the edges are scalloped. If you are near an IKEA you can go in and get them for very little- I once purchased them for $8 for two panels. However, I linked to them on Amazon for convenience. I love linen, and these curtains are an extremely affordable way to bring in a luxury look. They are a bit heavier than the other options. We have them in the white and the navy for my son’s room. All in all, window treatments help to create the mood for a room, so it’s up to you to determine what you are trying to accomplish. 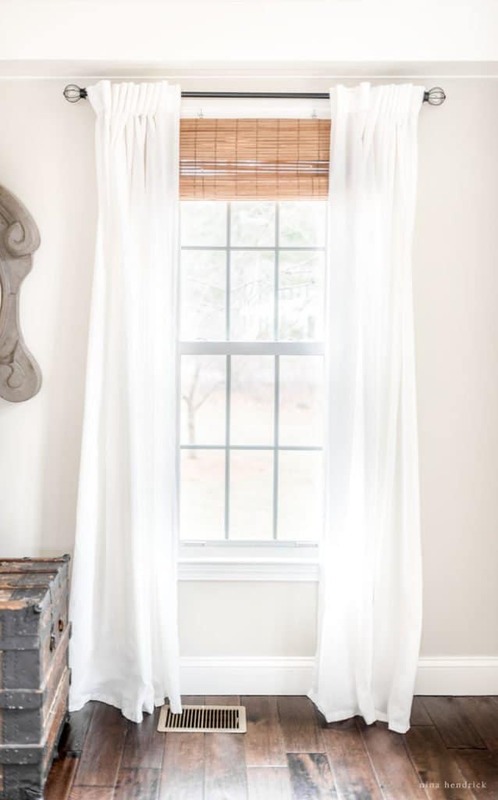 If you are looking for a light, airy, and warm look I hope that these ideas for stylish budget window treatments were helpful to you! You have finally solved my delima regarding shades and curtains for the windows. I have bought blue material, white material and heaven knows what else trying to decide what to do with my windows. Thank you so much for your post. I’ve just discovered your site and have looked around a bit, I am certain I’ll return. Keep up the great work Nina! So glad to help Marie, thank you so much for stopping by! I think the window treatments you’ve come up with are fantastic! The bamboo roll up shade complements the white drapes nicely. It’s a great way to add a custom look to your house. Thanks for the window-decorating inspiration! Thank you for helping my solve my dining room window treatments dilemma. I can’t wait to put it to action. Love your site by the way. What color paint is on the walls? Hi, Daneen! It’a Benjamin Moore Edgecomb Gray. Hi – I LOVE what you have done with your windows in this post – especially the price! When I went to Amazon to order the curtains, many of the reviews say the curtains are more of an off white, but they look pretty white in your photos. 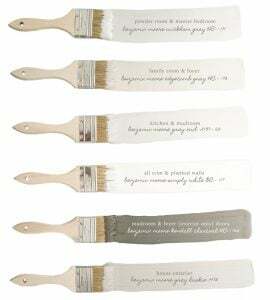 I need them for a dark grey bedroom where we are doing white accents. Any thoughts on whether these will work or look too creamy? Thanks so much!! They are definitely a bit on the cream size- if you are putting them up against a stark white it will be noticeable. All of my “whites” are actually off-white, so that may be throwing off the perspective! Can you tell me the name of the IKEA curtain panels you suggest? They are the VIVAN panels. Hello! Love the bamboo shades. Noticed when I went to purchase the mounting hardware that she’s is black. I do not notice the black in your pictures. Did you she something different to hang yours? Hi Amie, My shades came with stainless hardware, but they may have changed the design since then. They are about 5 years old. Hello! Did you roll your shades forward or backwards? I can’t seem to get the same look rolling forward as instructed. Also, the shades in your kitchen appear to have a valance? Are those shades different? I thought that you had mentioned that these were the shades that you used mostly throughout your home (with the exception of the Home Depot style)! 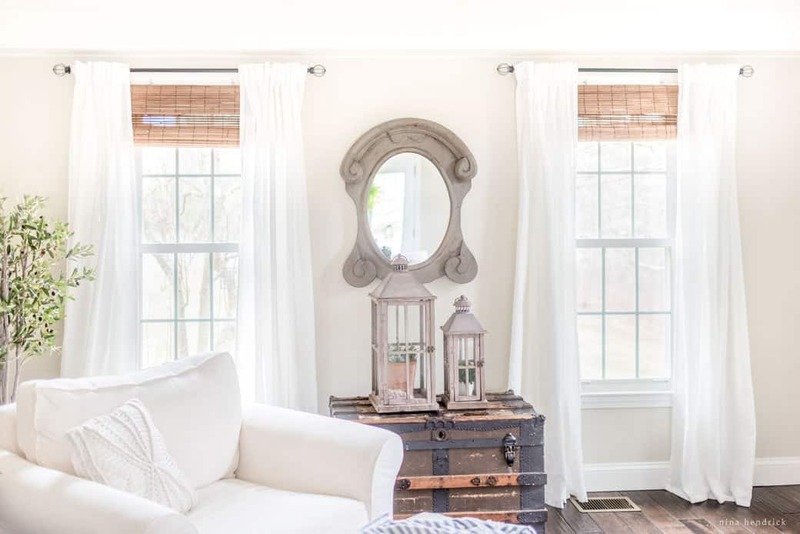 Could you tell me where to find the curtain rods in the picture? Thanks for a most informative article. I wonder if you can tell us you’re wall color choice. Thx! Hi, Pam! It’s Benjamin Moore Edgecomb Gray.